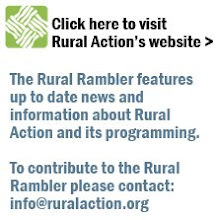 The Rural Rambler: Annual Planting Stock Program is now accepting orders. Annual Planting Stock Program is now accepting orders. The Rural Action Sustainable Forestry Team is now accepting orders for stratified American ginseng seeds and goldenseal rootlets for fall planting. Orders will be accepted during July and early September 2009. To place an order call Tanner at 740-767-4938, or email me at tanner@ruralaction.org. Click here for more information on Rural Action's Planting Stock Program.